The oldest golfing ‘Major’ is changing to become more like its vivacious cousin – as celebrities, professionals and former golfers jet into Scotland this summer and party at The Open, “Augusta-style”. 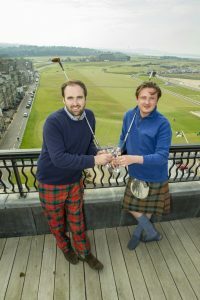 For the first time at The Open Championships, Hamilton Grand Live (22 July) will be an exclusive all out after-party, where fans can dance alongside some of their golfing heroes and celebrate another golfing triumph on Scottish soil. Celebrities from the world of sport and entertainment are on the guest list put together by events impresario, Ross Murray, whose track record for glamorous is one to be rivalled, having organised and hosted exclusive events and experiences around the world. Held in a golf-ball shaped arena on the land of local farmer Beau Fairlie and with two ‘floating’ miniature golf greens, it will be spectacular. And to mark the 147th Open at Carnoustie, 147 tickets are being made available to members of the public at only £250.00 per person fully inclusive of all food and drink. The Open is the oldest golfing major, but it is way behind the times when it comes to celebrating the conclusion of the event. The Masters at Augusta throws spectacular parties and we intend to do the same at Carnoustie. Our party will be the place where some of the players want to go and celebrate and we fully expect the guest list to be littered with celebrities and VIPS to be toasting the tournament’s success with us. As our office overlooks the fairways at Carnoustie, it was one of those light bulb moments when we realised there was an opportunity to provide an after party. And rather than restrict it to just professionals, former golfers and VIPs, we decided to open it up to everyone.